Tex-Mex is not the most authentic of cuisines. Classic Frito pie owes more to the convenience store than to Abuela’s kitchen; no amount of refried beans can make corn chips and Hormel chili stand in for the ancestral pull of true Mexican food. That’s not to say Tex-Mex lacks heritage. The food embodies the cross-fertilization you see whenever cultures meet. Creole gumbo wouldn’t exist if Nova Scotia Acadians and folks from the Caribbean hadn’t bumped into each other in Louisiana. In the case of Tex-Mex, evidence of that timeless sharing doesn’t reveal itself in filé spice, okra, and rice but in the Day-Glo sheen Velveeta contributes when draped over a chalupa. It may not be foodie heaven, but it’s unaffected and real. Heritage is why Josef Centeno chose to focus on Tex-Mex at Bar Amá, his newest restaurant. He grew up in San Antonio. But with a Latino background that includes Irish, Spanish, and German strands (hence the Josef), he was crossing borders from the get-go. Though Centeno isn’t one to crow about his polyglot approach, if you look at his menus (I have them from several restaurants), you can appreciate how the common thread connecting his ingredients isn’t geography or culture; it’s the force of their flavor. At Lot 1 Café, the Echo Park spot he helmed for the blink of an eye, Centeno fastened the lightness of a haute beet gazpacho in place with crunchy chi-charrón. At the Lazy Ox Canteen in Little Tokyo, he paired all-American buttermilk-battered quail with a helping of Italian quince mostarda. And at Bäco Mercat, his breakout restaurant on Main, Centeno uses Abkhazian chile spice to underscore the brininess of hamachi crudo. Centeno didn’t have a concept in mind for another restaurant when his landlord at Bäco Mercat offered him a location around the corner on 4th. So the chef, whose inspiration arcs effortlessly over continents, finally looked inward. This is the food, he says at the top of the crowded menu, “that I was nurtured with by the women who raised me. Bar Amá is my interpretation of their Tex-Mex.” Maybe that’s one reason he holds off on giving the room any hokey touches. You won’t find longhorns or Lone Star neon. 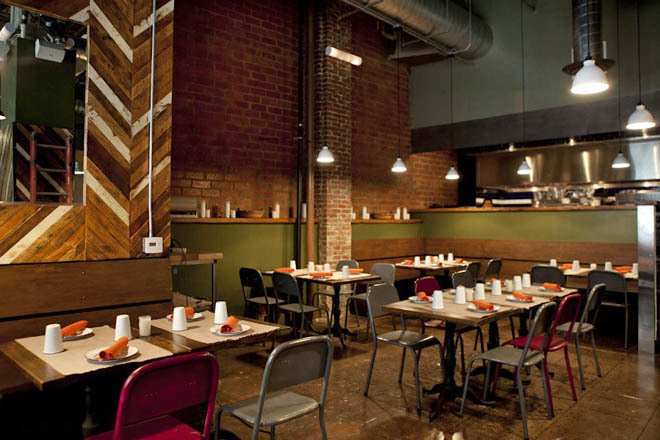 Instead you get a modern, utilitarian space with exposed vents, some wood-slat paneling, and basic metal chairs. With the cattle drives of Lonesome Dove as a birthright, Centeno has no need to slap Willie Nelson head shots on the walls to prove his Texas cred. To be transported you need only take a bite of a puffy taco, whose masa—pulled from the fryer at just the right moment—has closed in around a braised pork cheek like the bell of an exotic plant around its prey. Centeno may only be riffing on Tex-Mex, but he always keeps the original respectfully in view. A flowing mass of cheddar, Jack, and panela that’s been boosted with sour cream and fresh guac, the Tex-Mex queso would be recognizable to anyone who’s had the Velveeta variety back home. Same with the green chicken enchiladas, whose Jack cheese billows and browns atop the tortillas. Hefty but delicate, they’re modeled after the ones his mom would leave for Centeno and his brother to dispatch after school and lacrosse practice. The ceviches on the menu play it straight—the daily version cooks in lime juice and onions—and bubble with creativity. Chile and mango duel over the sea bream; Centeno gives a Peruvian inflection to marinated scallops jazzed up with quinoa and fried onion. But the standout dish is fideo, a type of noodle, which serves as a base for darkly grilled octopus and segments of smoky kielbasa. Moistened with shrimp broth that’s been blended with a chile vinegar, the vermicelli rides a surge of fiery acidity that’s balanced by the pitch-perfect dusting of crushed pepitas. Even at his most nostalgic, Centeno doesn’t overshare, the way some chefs do when they revisit childhood. Bar Amá is not about a celebrated chef returning to his roots; it’s about how Centeno’s youth calibrated his palate before he went out into the world. During his years of training, Centeno worked at enough French restaurants (from La Côte Basque to Les Célébrités) in Manhattan to understand that knife skills can imbue produce with different meanings: The tiny cubes of a brunoise communicate rigorous craft, whereas the thick julienne of a jardinière that may go into a mayo-infused salad has a homier feel. For him, vegetable preparation starts thus. Cut too large, jicama can taste like a watery root. Centeno reduces his to the size of matchstick potatoes and folds them in with cucumber and radishes. To create a version of his grandmother Amá’s Caesar salad, he shreds Little Gem lettuce and tosses it with a powerful vinaigrette of anchovies, garlic, and chipotle. The kick of the anchovies serves as a reminder that, but for a few exceptions, Centeno has pretty much left the Mediterranean larder behind. In fact, an argument could be made that he’s been working toward this moment, draining the menu of his go-to ingredients but maintaining the fixation on technique. Peer into his borracho beans and you see roasted cubes of bacon and carrots mingling with the guajillo-and-paprika-laden juices of a house-made chorizo—a heady broth he splashes with Negra Modelo. The oxtail meat in his grandmother’s mondongo, a hybrid of menudo and pozole, is so tender, it combines with the honeycomb tripe and hominy to form a single morsel. With the warm slice of jamón de cabeza, or head cheese, he shows how agile he is with acidity, using a pickled vegetable escabeche to underpin the rich jellied sliver. Surprisingly the chiles rellenos are a rare misstep. Instead of being firm to the point of crispness, the peppers should be flame broiled longer to play up the freshness of the Oaxacan cheese filling. They’re fine, but when you taste the salad of poached nopales, you realize how much farther he could have gone with the chiles relle-nos. Cutting the cactus paddles into slivers—classic enough—he combines them with slices of hearts of palm that he has lightly grilled to draw out a little meatiness before underscoring it with a tingle of epazote and a sprinkle of quesillo. Fittingly, for a guy whose home state may as well have a Weber grill in its official seal, Centeno is particularly good with meat. He breaks down the racks of goat he gets from the Central Valley, rubbing them with ground cascabel chiles and serving the grilled chops with belly, a few slices of roasted leg, and a side of coleslaw. The beef fajitas (sold by the pound) arrive in a sauce based on his father’s marinade, a bold concoction that at first snort seems equal parts fresh-squeezed limes and Worcestershire sauce. Centeno uses lengua, or tongue, as the base of the chili. After steaming the meat for hours over an aromatic broth, he peels off the outer membrane and grinds the muscle. A few more hours on the stove results in a luscious chunkiness as he pours the tongue over a pile of salty Fritos. Centeno caps his rendition with house-cultured sour cream, a layering of textures and flavors that when given a jolt of heat, is central to his style. In the same way, he breads his chicken-fried steak (probably closer to Hill Country than Tex-Mex) with saltine crackers, smothering the golden brown coating in a white sauce made from Cream of Wheat, then finishes it with a jigger of “bus driver” sauce, the fierce brew of chiles he makes and bottles in-house. In the decade or so that I’ve been following Centeno, I’ve never known him to be a chef given to over-the-top desserts. Half the joy of the pineapple upside-down cake at Lazy Ox was its simplicity. Here a spoonful of cream is all that’s needed to nail the right level of moistness in the tres leches cake, a standard chiffon whose floury batter of creamed sugar and eggs is leavened with baking powder. The prickly pear Popsicle would be even more refreshing under a tree by the Alamo. The warm sopapilla is a tortilla fresh from the fryer and drizzled with honey. Chased with a bit of single malt whiskey from Balcones, an Austin distiller, it’s enough to inspire memories of the Texas childhood I never had. That sense of the everyday is one reason I love eating breakfast dishes, which the kitchen starts serving at 11:30. I order the migas, a big scramble of eggs and corn chips that is finished with lightly sautéed baby tomatillos and chile de arbol salsa. It’s an artfully artless dish that helps me glimpse the span of a career. Artisanal, produce driven, nose to tail, rustic Italian, Asian inflected—Josef Centeno has waved away all the labels by which we categorize chefs. I’ve seen him blow open categories (there was that four-course $30 tasting menu at Opus), shift from the delicacy that marked his style at Lot 1, and settle into a technique that balances forcefulness and finesse. But I’ve never seen him define himself so emphatically as he has here. It’s about time. In glancing back at the everyday food of his youth, he’s taken a big step forward.